Introduction to the Craftwerk Aluminum Case for iPhone 5. Our Aluminum case is a protective solution for your iPhone 5 that is CNC machined from a single block of air-craft grade Aluminum. This case will maintain the elegant shape of your iPhone 5 with it's minimalistic design features. When desiging this case, installation was also a key element. We wanted a simple screwless installation, so we engineered a slide to lock mechanism. Our team did not just stop at designing this Aluminum Case. We wanted users to be able to keep our packaging, so we came up with an ingenious idea to re-use it. Our package also functions as a Smart Dock. Lay your iPhone 5 on it in portrait mode, and it will amplify the sound of your music and videos. Lay it in landscape mode and surf websites, view e-mails, etc. with ease. 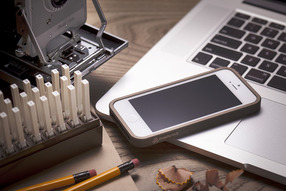 There are also holes cut out so you can stick your iPhone's USB cord in the desk companion and charge your iPhone while it is docked. 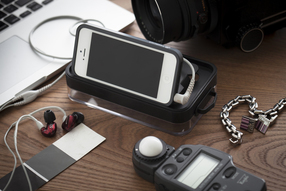 The combination of our Aluminum Case and the Smart Dock Packaging is the perfect solution for your mobile lifestyle. 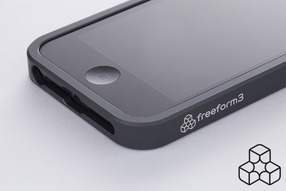 ** Works with our Gorilla Protection for iPhone 5. ** Some users may experience 5-10% in signal loss due to irregularities in cell phone coverage.